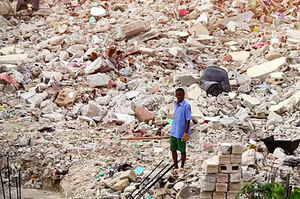 As we remember the devastating earthquake that struck Haiti five years ago, it is important that we understand that tragic event in the broader context of that nation's recent history. Thirty-four years ago, I was assigned to Haiti for two years as an economic officer in the U.S. Embassy. In this position, and as I traveled the country, I learned much about the deeper issues affecting the country, and over time I grew to understand Haiti's economic plight intimately. My interest in Haiti has never left me, and the people of Haiti are close to my heart. In the intervening three-and-a-half decades, Haiti has been through many changes; sadly, it has been mostly a continuation of the downward spiral of coups d'etats, trade embargoes, crime and violence that Haiti has experienced through much of its history. 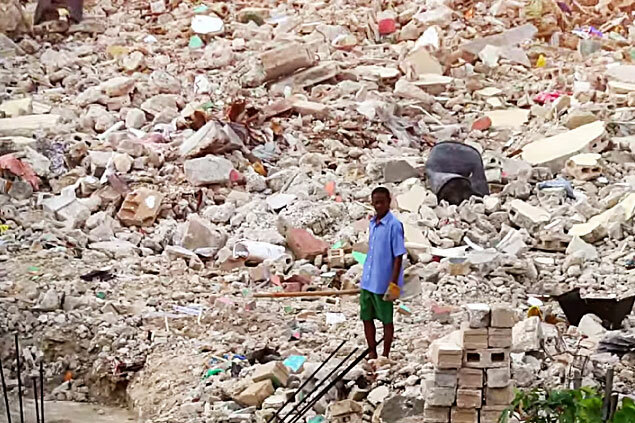 Just one of many such signs of the country's deterioration came in 2004 when Cite Soleil, the infamous largest slum neighborhood of Port-au-Prince, was declared "the most dangerous place in the world" by the UN. In spite of its bleak history, though, the situation began to improve in the past decade. The UN and former President Rene Preval's government brought tentative stability to the country. Rampaging crime gangs were brought under control, both kidnappings and homicides decreased, and the economy began to show signs of improvement. In the months before the earthquake, things were looking brighter for Haiti. Then the earthquake struck, bringing an unprecedented level of death and destruction to the country. But that disaster was neither an end nor a new beginning - it was a tragic interruption in the slow but sure improvement of the country's development. Six weeks before the earthquake, my organization, Global Communities, inaugurated the completion of a road, Route Neuf, through Cite Soleil, the area previously considered too dangerous to enter, much less for construction. There had been many previous attempts to build this road that had all ended in failure. But with support from the U.S. Agency for International Development (USAID), local businesses and the community, including reformed gang members, we were able to complete it. Now, Route Neuf experiences heavy traffic and, is the chief thoroughfare from the sea port to the main national road, allowing commerce to be taken to and from the port easily, both bypassing and reducing the traffic choking downtown Port-au-Prince. As we remember the tragic events of five years ago, much of my focus is on the work done in partnership with the Haitian people prior to the earthquake, and that continues to be sustained today by their investment and effort, and by the partnerships with the community that are critical to long term sustainability. 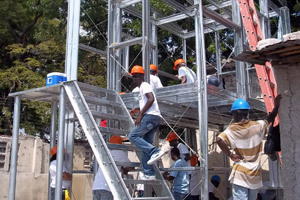 Although Global Communities is best known in Haiti for our innovative work reconstructing - and "building back better" - the leveled neighborhood of Ravine Pintade, we began partnering with the Haitian people in the early 2000s. In 2006, with USAID's support, we established the Konbit Ak Tet Ansanm, or KATA, program (Creole for working together to accomplish a common goal). Here, as with all our work around the globe, we took a community-based approach to identify priorities and involve the Haitian people in taking ownership of their projects. In partnership with Haitian communities, we repaired or built 79 kilometers of road, 19 kilometers of irrigation canals, and built 19 schools, all using Haitian laborers, and all of which survived the earthquake intact. Many of the schools became shelters for the displaced and roads became stable surfaces with drainage where camps were set up in the immediate aftermath of the earthquake. Global Communities' Haiti team recently went back to visit some of the projects to see how the participants are doing. Prior to the earthquake, Global Communities partnered with the local coffee company Rebo SA on the Ti Pilon project, which uses micro-entrepreneurs with street carts to prepare and sell Haitian coffee according to hygienic and sanitary standards. 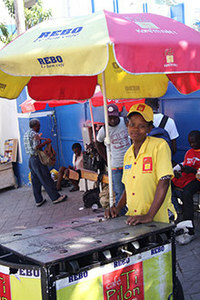 After the earthquake, the Ti Pilon coffee vendors in their distinctive red and yellow livery were a common sight in the streets, serving coffee and peanut butter sandwiches to people working to remove rubble. The project, which started with 15 micro-entrepreneurs just before the earthquake today has 75, and it has also created 200 jobs involving production of food and supplies, helping to stimulate northern Haiti's coffee industry, which had long been in decline. In another KATA project we partnered with the Haitian agricultural industry to construct the Post-Harvest Center of Grande Savanne. 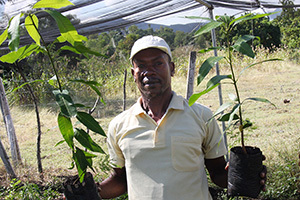 Grande Savanne is the second largest producer of Francisque mangos in Haiti, and this sector represents a major source of agricultural income for Haitians. The center, built by Global Communities on land donated by the community, provides agricultural training to help farmers meet the technical and sanitary standards required for production and marketing of mangos, and employs farmers who produce more than 300,000 mangos each year. When it was first built, the staff at the center numbered 40; today, more than 300 individuals are employed there. As USAID Administrator Raj Shah noted after his recent visit to Haiti, "In a country where children once ate mudcakes to ease the pains of hunger," the work of USAID and its partners, "now even helps mango farmers sell to Whole Foods". A third project we revisited was the area of Ravine Bussy. In the early 2000s, the ravine in Southeast Port-au-Prince experienced extensive flooding after every rain, which destroyed homes and threatened lives and livelihoods. Ravine Bussy was one of 10 ravines that we treated between 2008 and 2010 to help improve resilience against flooding. Global Communities worked with the community to install dry stone thresholds and plant seedlings of fruit and forest trees. Old structures on the ravine were repaired and ramps were installed. In order to sustain these structures, a monitoring and supervision committee of 11 members of the community was established. Members completed capacity building training where they learned and honed skills to help them to maintain the repaired ravine. Since the completion of the work, no damage has occurred in the area, whereas before, during even the slightest downpour, streets near Bussy were completely flooded. 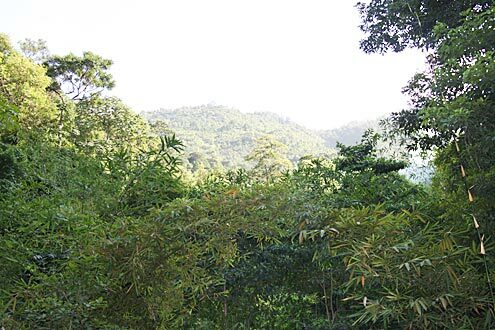 An added benefit is that Ravine Bussy is now a wooded, ecologically diverse area, an extreme rarity in a city as dense and polluted as Port-au-Prince, where virtually every tree is cut down to produce charcoal. These are just a few of the examples of work that predated the earthquake and not only survived, but have continued to improve lives and livelihoods, and increase sanitation and safety. Far from pressing a devastating reset button on Haiti's development, with the involvement, determination and leadership of the community, and by involving Haiti's own private sector, we were able to co-create projects that became sustainable in spite of everything that has happened since 2010. They are a demonstration of the resilience of the Haitian people. I can only hope that, in the next five years, we will continue to see improvements in Haiti. The history of Haiti has been plagued by frequent political setbacks and natural disasters, but as long as we engage and involve local Haitian communities in the planning, implementation and sustainability of their development, the people of that country should be able to prosper with freedom and dignity.